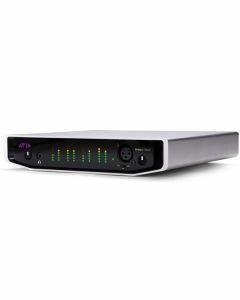 Avid Artist | DNxIV provides all the professional analog and digital I/O you need to plug into today’s diverse media productions. Avid Artist | DNxIV provides all the professional analog and digital I/O you need to plug into today’s diverse media productions. From quad 12G/6G/3G-SDI, HDMI 2, and DB-25, to XLR, LTC, RS-422, and a headphone jack, you have a variety of connections available to integrate your gear together for in-studio video and post production—or wherever inspiration takes you. Small in size, but vast in versatility, Avid Artist | DNxIV boosts your media production capabilities beyond the standard capture, monitor, and output workflow. Leverage its portability to work on projects out in the field. Record voiceovers with easy audio punch-in. Monitor HDR content. Sync to an external reference. Control tape decks for frame-accurate captures and layoffs. Coming soon, you can even use the interface as an 8-channel audio surround sound monitoring solution. * Currently not supported in Media Composer.